Condos in Toronto are a great option for investors, as values are rising by around 10% a year. 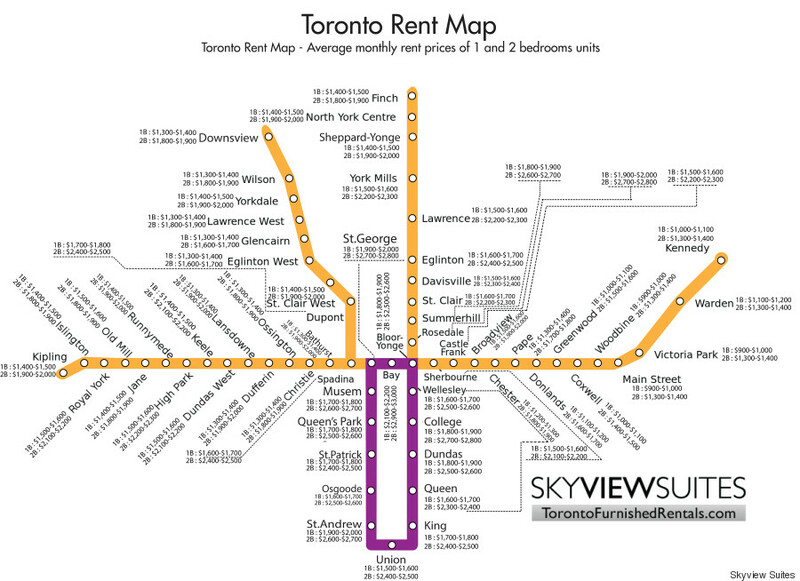 To demonstrate this fact, a Toronto rental website has produced a map of the Canadian city’s subway system along with rental property rates in the area. Subway stops highlighted in purple (dense condominium locations), exclusively represent rent data on relatively newer high rise condominium developments. Subway stops highlighted in orange represent rent data from all types of dwellings including homes, apartments and condominiums. As you move away from the downtown core, rental prices start to come down. The most expensive areas to rent are near Bay, Bloor-Yonge, Rosedale and Summer Hill stations, where a lot of wealthy Torontonians call home. Surprisingly, the rental prices around Union Station are lower than other stations in the area (for example, St. Andrew, St. Patrick and King). GICs/Government Bonds (Risk Free) – Returning roughly 1%-2% per year (depending on term) AA & AAA rate Corporate Bonds (Low Risk) – Returning 3%-4% per year Stock Market / TSX – Return has been extremely volatile since 2002. An individual buying into the market in 2007 would have seen their investment shrink if that money were still invested in the market today. No one can say for sure how real estate prices will behave in the short term, but for the long term investor, it’s clear that investment condos in Toronto are a very attractive option. Rent data was collected over the course of a year from multiple sources for both one and two bedroom condos/units in the vicinity of each subway station. Toronto property selling prices rose 12.1% in the year to March 2016, according to the MLS Home Price Index Composite Benchmark for March 2016 for all home types combined.